The International League of Peoples’ Struggle (ILPS) stands firmly with the Palestinian people that Jerusalem is the rightful capital of Palestine and therefore joins the Palestinian people and the rest of the world in condemning the decision of US President Donald Trump to recognize Jerusalem as the capital of Israel and to relocate the US embassy from Tel Aviv to Jerusalem. With this brazen act, the US has incurred the rightful condemnation of the Arab peoples and the whole Muslim world and has once more exposed to the world the utter disregard by the US for established international conventions and norms. All Arab countries, including ultra-reactionary and pro-US Saudi Arabia, have denounced Trump’s decision. Even western governments that blindly follow US policy have expressed disappointment and concern at Trump’s decision. The United Nations and most countries have refrained from recognizing any country’s sovereignty over Jerusalem which is a city holy to Muslims, Jews and Christians alike. Israel occupied West Jerusalem during the 1948 Arab-Israeli war and later East Jerusalem in the 1967 Arab-Israeli war effectively putting the entire city under de facto Israeli control. The UN and the international community officially regard East Jerusalem as occupied territory. And therefore has declared as illegal any attempt of Israel to annex it. In 1980, Israel enacted the so-called Jerusalem Law that claimed that Jerusalem being now united declared it as the capital of Israel in an attempt to formalize its annexation of East Jerusalem. In response, the UN Security Council passed Resolution 478, declaring the law null and void. The so-called Jerusalem Law violates the principle under international law that an occupying power does not have sovereignty over the territory it militarily occupies. Undeterred, the Zionists have illegally built settlements in East Jerusalem to consolidate its control over the city. The UN has affirmed in many resolutions that these settlements violate the Fourth Geneva Convention which prohibits an occupying power from transferring its population into territory it occupies. The purpose of such prohibition is to ensure that the military occupation is temporary, to prevent the theft of resources from the civilians under occupation, and to prevent apartheid and changes in the demographic makeup of the territory. Since its occupation of East Jerusalem, the Zionists have built more than a dozen settlements for Israelis right in the middle of Palestinian communities. Some 200,000 Jewish Israeli citizens now live in those settlements under heavy guard from the Israeli army and police. While the Israeli authorities have built settlements for their Jewish citizens, they have destroyed some 20,000 Palestinian homes according to United Nations records. Israel has blatantly disregarded all UN resolutions censuring its actions. It has done so mainly because the UN resolutions while correctly citing the bases and principles for censuring Israel’s actions nevertheless have no teeth containing no accompanying sanctions. The US has always opposed any attempt in the United Nations to impose sanctions on Israel. Trump’s latest decision will further embolden the Zionists especially under the ultra-rightist Netanyahu regime to commit even more dastardly crimes against the Palestinian people with impunity. 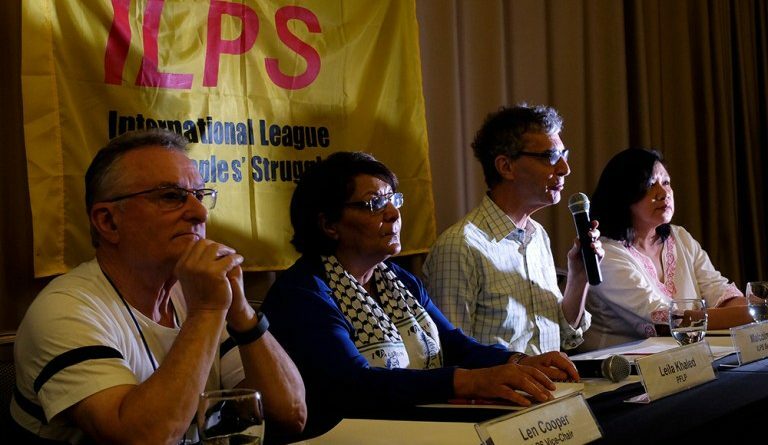 The International League of Peoples’ Struggle reiterates its support to the Palestinian people in their just struggle to end the illegal Zionist occupation of Palestine, for the right of all Palestinian refugees to return to their homeland and for the Palestinian people to establish their own state with Jerusalem as its capital. We call on all freedom-loving peoples of the world to support the Palestinian people in their just struggle.